Dedicated to supporting Mini-Sprint 600 to 1200cc racing across the USA. Get news, links and rule guidelines. A midwest based Mini-sprint race team. Includes photos, information and links to similar sites about Mini-sprint racing. Sanctions 1200cc mini sprint racing in North America. Promotes national level events from Colorado to Indiana. 1/4 mile, high banked, dirt oval features Late Model, Midget, IMCA Modified, Street Stock, Econos, Outlaw Mini Sprints, Mini Sprints, Dwarf, Go-Kart, Mini Micros, Trucks and Micro Sprint racing events. Includes track information and admission prices, schedule of events, race results and season standings. This 1/3 mile, semi-banked, clay oval is located in Mohave Valley. Classes raced include IMCA Modified, Dwarf, Factory Stock, Mini Sport Car, Mini Sport Truck, Sprint Car and Western Dirt Late Models. Wisconsin Mini-Sprint Association information on race reports, standings, drivers, schedule and a rulebook. Every sprint car organization is represented in the worlds largest online collection of sprint car photos. 100s of drivers and cars to be seen and some other great information. A 1/6th mile, banked, clay oval Mini-Sprint track and home to the Clay Cup Nationals. Many photos from 1999 and good archive on photos from the past. Complete Winners List for WoO, All Stars, URC, and the Pennsylvania sprint car tracks, which are updated regularly. There is a on line sprint racers poll which you can take and the question changes often. If you are looking for a certain photo you can email to see if they have it. A Mini-Sprint track located in Deming. It is a 1/6th mile, banked, clay oval and home to the Clay Cup Nationals. This 1/3 mile, dirt, oval is located in Lamont. Classes featured are Micro Sprint, Pure Stock and Mini Stock. Results, points, photos, news, awards and contests. This 1/4 mile, clay, oval located in Hudson Valley features Modified, Sportsman, Pro Stock, Go Kart, Quad, Pure Stock, and Mini Sprint racing. Schedule, points, news, polls and track information. A 3/8s mile, dirt, high banked, oval race track located in Casa Grande. UMP Modifieds, UMP Late Models, Street Stocks, Dwarf Cars, Mini Sprints and Sprint cars are featured. Aaron Lifford is an up and coming 600cc mini sprint driver. Located in Indianapolis, IN. Aaron has been racing for 5 years with 21 heat and feature wins. Preserves the history of sprint car racing and honors its achievers. Includes press releases, a list of National Sprint Car Poll winners and the list of Hall of Fame Inductees. Rules and regulations on motorcycles, Three Quarter Midget, Midget, Sprint Cars, Saloon Cars, Modifieds, Stock, Street Stocks and Mini Stocks. Discussions include late model, vintage, sprint car, modified, stock, mini stock, schedule, classifieds, pavement late model, NASCAR, and figure 8. Chat room available. Located in Knoxville, Iowa at the Knoxville Raceway. It is preserving the history of sprint car racing and honors its achievers. There are press releases, a list of National Sprint Car Poll winners and the list of Hall of Fame Inductees. Located in Show Low, this 1/4 mile, dirt oval features IMCA Modifieds, Late Models, Pro Stocks, Dwarf Cars, Mini Stocks, USAC Sprint Cars and Arizona Midgets. Rules, press releases, schedule, results, points and driver profiles. This 1/4 mile dirt oval race track features IMCA Modifieds, Late Models, Pro Stocks, Dwarf Cars, Mini Stocks, USAC Sprint Cars and Arizona Midgets. Rules, press releases, schedule, results, points and driver profiles. Located in Cheyenne, this 1/5 mile semi-banked asphalt oval features Late Models, Pure Stocks, Mini Stocks, Super Stocks, Legends, Dwarfs, Baby Grands, Mini Trucks, Mini Sprints, Modifieds and Thunder Car racing events. USAC, SCRA and NWWC news, results, upcoming races and drivers links for the non wing sprint car fan. If the business hours of Mini Sprint Racing in may vary on holidays like Valentine’s Day, Washington’s Birthday, St. Patrick’s Day, Easter, Easter eve and Mother’s day. We display standard opening hours and price ranges in our profile site. 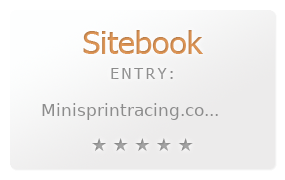 We recommend to check out minisprintracing.com/ for further information. You can also search for Alternatives for minisprintracing.com/ on our Review Site Sitebook.org All trademarks are the property of their respective owners. If we should delete this entry, please send us a short E-Mail.